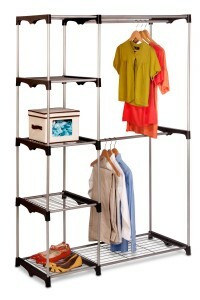 There are a couple of customizable shelving systems for closets: ClosetMaid and Rubbermade. They are very similar and fairly easy to install. Their elements can be purchased separately as well as in kits. This allows for building custom designs that fit any closet. Both systems use wire shelves which are much lighter than wooden shelves. They also don’t allow dust to accumulate and don’t need cleaning when mounted in closets. In contrast John Louis closet systems come in sets. They allow for some customization because each kit can be mounted in a few configurations. John Louis closet organizers are wooden with ventilated shelves. They look nicer than the wire shelf systems but also cost more. 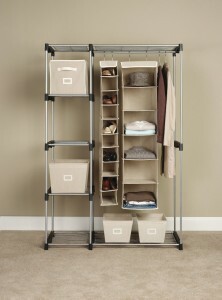 There are also stand-alone closet organizers which do not need any installation. 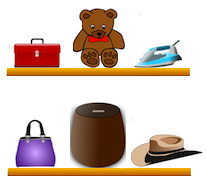 ClosetMaid has two mounting systems. The first utilizes shelf tracks and is good for heavier weight. It also allows for changes in the shelf height and for easy addition of new shelves. Its elements are known as adjustable mount hardware. We use it in our garage. The second system uses just mounting brackets for support and cannot be adjusted. Its elements are known as fixed mount hardware. The shelves and the mounting hardware are sold separately. For perfect fit to your closet you may need to cut the shelves. We have 24″ deep closets and had to cut the 48″ long shelves in two in order to have shelves on the sides. 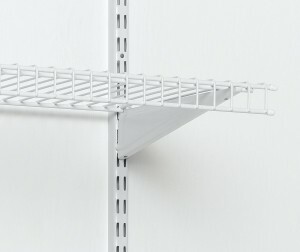 There are also ClosetMaid kits with precut shelves and mounting hardware. 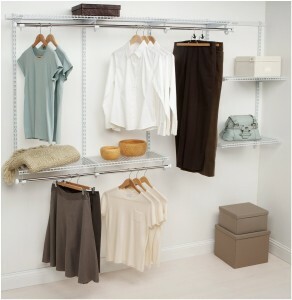 Rubbermaid has many different closet systems in their collection: FastTrack, HomeFree, Configurations, and Direct Mount. Similar to the ClosetMaid, components are primarily wall-mounted track, rods, shelf brackets and shelves in different sizes and finishes. Be very careful when choosing parts because the systems are not compatible with each other. To make matters worse, Rubbermaid sells rails called FastTrack that are completely different from the closet line ones. If you want to customize your system, it is best to go to a local store, such as Home Depot or Lowes. 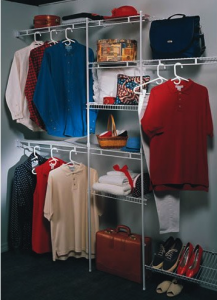 Rubbermaid also offers closet organizer kits which include shelves and mounting hardware. For more elegant look John Louis offers wooden closet system in various configurations. The Standard, Simplicity, and Premier Organizers are 12″ deep, while the Deluxe Organizer is 16″ deep. All four are made in two finishes: red mahogany and honey maple. They are offered as kits with all needed elements in the box and can be assembled in multiple configurations. They are designed for reach-in and small walk-in closets up to 10 feet in length. The shelves in these organizers are 24″, 48″, or 72″ long. Additional shelves can be purchased separately. Stand-alone wood towers for shelves and drawers can be added as well to expand the main kit. Mounting hardware such as 12″ and 16″ angle brackets for supporting shelves without side support, wood garment bars and and spacers, and metal garment bars, can be purchased as well. In contrast, the Woodcrest collection is offered as separate elements in caramel and espresso finishes. It is more limited than the above four collections and contains only stand-alone wood towers, shelves, and drawers. 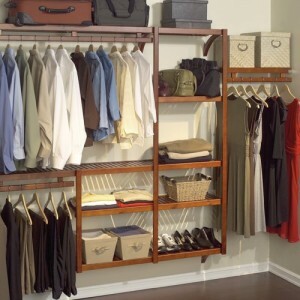 If you don’t want to install a closet organizer, there are a few stand-alone shelving kits. The Seville Classics organizer shown here is 72″ tall, 14″ deep, and expands in width from 58″ to 83″ to accommodate most closet spaces. 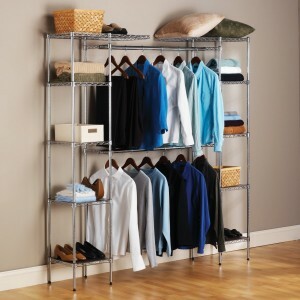 Similar but smaller and non-adjustable organizer is offered by Whitmor as well. It measures 45.2″W x 19.2″D x 68″H. 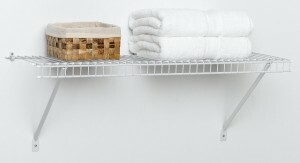 For additional storage hanging shelf organizers can be added as well. Honey-Can-Do has almost identical but slightly shallower organizer at 42.5″W x 17″D x 68″H. 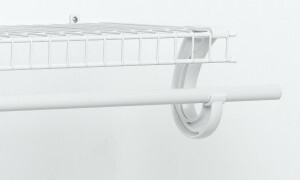 Pant trolleys are great for hanging slacks at the bottom of the closet. The trolleys by Woodlore come in two sizes: regular (29″L x 26.75″H x 16.875″D, for 15 pairs, item number 82061) and compact (24.75″L x 26″H x 16.25″D, for 10 pairs, item number 82063). The image of the regular pant trolley on Amazon is not accurate. It looks the way it is pictured here. Additional aromatic cedar pant rods are also available. 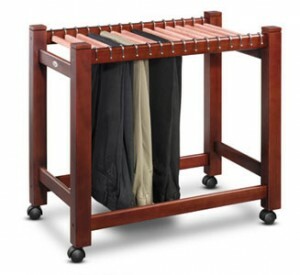 Another option is the less expensive metal frame pant trolley measuring 27.5″W x 15.5″D x 25.5″H, with 18 metal hangers. Shoe racks are another bottom-of-closet organizer. The Whitmor shoe rack pictured here can hold 20 narrower shoes and 16 wider ones (such as boots and men’s shoes). It is sturdy and easy to assemble. I am so glad i came across your site. My bedroom closet is so old and the shelving needs change badly. I was dreading it because I thought I need to drill new holes in the wall for the new shelves. Now I will just buy standalone shelving and i’ll be done in no time.